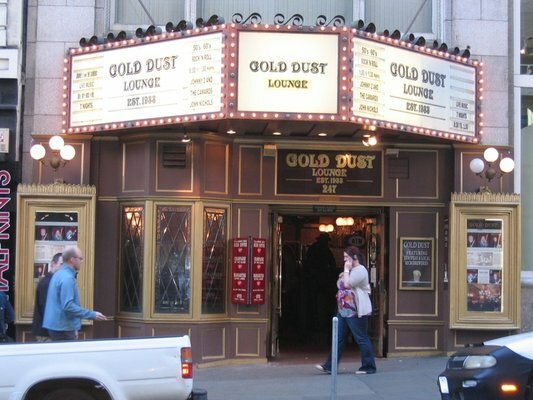 The Gold Dust Lounge doesn’t have to go home, but it can’t stay at 247 Powell Street. The longstanding San Francisco watering hole will be evicted from its current Union Square premises by March 7, according to Sam Singer, spokesman for building owner John Handlery. Handlery, who owns the nearby eponymous Handlery hotel as well as the real estate occupied by a nearby art gallery — all of which has been leased to a new tenant — handed the Bovis family, owners of the Gold Dust, eviction papers in early December. The terms of the bar’s lease allow the landlord to evict the tenant with 90 days notice, Singer noted. That notice was delivered in early December. Singer’s announcement earned the seasoned spokesman a cavalcade of boos at a packed Gold Dust Lounge, where twenty-five-cent drinks provided a raucous audience for a Thursday afternoon press conference called by supporters of the bar, which has graced Union Square for decades. Three members of the Board of Supervisors pledged to find ways to save the bar, dubbed an “historic San Francisco institution” by Supervisor Jane Kim, from eviction. Notable Gold Dust loungers included the late Chronicle columnist Herb Caen, singer Janis Joplin, and actor Steve McQueen. Some sort of negotiated settlement appears to be the likeliest outcome: there is hope that the Bovis family can meet with Handlery and flesh something out. A meeting between the two parties was scheduled for last week, Houskeeper said, but Handlery canceled after news of the eviction was leaked to the press. Who, for his part, has indicated that the decision is made: the nearby Weinstein Gallery has also received an eviction notice to make way for the new mystery retail tenant.